Open the In-Place Text Editor. Type a title (for example, DESIGN CRITERIA). If you want the title underlined, click Underline on the Formatting panel (or the Text Formatting toolbar) before you type the title; click Underline again to turn it off. Press Enter to go to the next line, and press Enter again to leave a little more space. On the Paragraph panel of the Text Editor tab, click the Bullets and Numbering drop-down button; verify that Allow Auto-List, Use Tab Delimiter Only, and Allow Bullets and Lists are selected; then click Numbered. The number 1 followed by a period appears on the current line, and the cursor jumps to the tab stop that’s visible on the ruler, at the top of the In-Place Text Editor window. Enabling the Numbered option places numerals followed by periods in front of items in a list. (The Bulleted option places bullet characters in front of items in a list.) Allow Auto-List enables automatic numbering; every time you press Enter to move to a new line, AutoCAD increments the number. Type the text corresponding to the current number or bullet. As AutoCAD wraps the text, the second and subsequent lines align with the tab stop, and the text is indented automatically. Press Enter at the end of the paragraph to move to the next line. As with creating numbered lists in your favorite word processor, AutoCAD automatically inserts the next number at the beginning of the new paragraph, with everything perfectly aligned. To create nested numbered or bulleted items, simply press Tab at the start of the line. If you change your mind, you can bump up a nested text item up one level by selecting the item in the In-Place Text Editor and pressing Shift+Tab. Repeat Steps 4 and 5 for each subsequent numbered or bulleted item. For legibility, you sometimes add spaces between the notes. If you press Enter twice to add a blank line, AutoCAD — like every good word processor — thinks you’re finished with the list and turns off numbering. AutoCAD is smart, so you need to be smarter. If you put the cursor at the end of the first note and press Enter, you get a blank line. The problem is, the blank line is now numbered, and the intended Note 2 is now Note 3. Just press the Backspace key. The number on the blank line disappears, and Note 2 is back to being Note 2. When you delete a numbered item, the remaining numbers adjust automatically. If you don’t like the horizontal spacing of the numbers or the alignment of subsequent lines, you can adjust them easily by manipulating the tab and indent markers in the In-Place Text Editor’s ruler. In the ruler, drag the upper slider (the triangle pointing down) to the right a short distance. Drag the lower slider (the triangle pointing up) a slightly greater distance to the right. The upper slider controls the indentation of the first line in each paragraph. The lower slider controls the indentation of the second and subsequent lines. An indent of one to two of the short, vertical tick marks usually works well for the first line. An indent of two to four tick marks works well for the second and subsequent lines. Click in the ruler just above the lower slider. A small L appears above the lower slider. The L shows the left-justified tab stop. Make sure that the corner of the L aligns horizontally with the point of the lower slider triangle. If not, click and drag the L until it aligns. 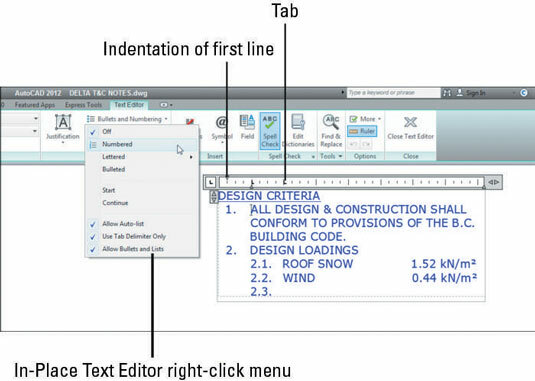 Whichever way you do it, if you select text first, the tab and indent changes apply to the selected text. If you don’t select text first, the changes apply to new text from that point forward in the multiline text object.